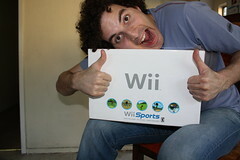 Yet another part of my exciting win as King of Cubicles is my brand new Wii, which arrived this week in the mail. I was so excited to get it – especially when someone reminded me that my life is a lot more like a year long Christmas than most other people’s. The thing is, I got this Wii worth $250 or so, and after playing for about 10 minutes, went straight to the Game Shop where I blew $380 of my own money on a Wii Fit, extra controllers and games. I am not made of self-control. Eventually, I’ll be getting “Rubik’s World” in the mail, the game that is responsible for my whole prize package, but until then, I got myself Mario Party 8 to hold myself over. It’s totally awesome. b) One where I can do puzzles that make me feel smarter. c) One that simulates cooking, but without the hassle of eating food at the end (I think there’s one of “Hell’s Kitchen with Gordon Ramsey,” but is that actually the BEST one on the market? In the meantime, I will continue my morning Wii Fit tests. « CBS News Again? Yes. Sort of. The star wars games you can swing a sword. They acutally have an attachment you can get for the controller to turn it into a sword.